I've found a way to double, even triple the ROI of your next Facebook ad campaign. Good, because most of you are already using the right tools. You're just not using them the right way. You gotta learn the right HACKS! Marketers who manage Facebook ads sometimes forget what they learned in Marketing 101. They think if they simply optimize their Facebook ads, they'll get their desired results. But they're only half right! You must develop a strategy before you even think about optimizing your Facebook ads -- a strategy based on a deep understanding of your target audience: what they like & what they'll likely respond to. But there's still no guarantee that Facebook will help you reach your target audience. It's on you to follow up & make sure that ad targeting is working! That's where Facebook ad reports come in. To view a report, go to the ad manager & click "Reports" on the left sidebar. Next, click “Breakdown: None” and select a category from the list. Let's say you choose to review your Facebook ad performance based on age, gender & conversion device. If you were running an e-commerce store, you could see whether your ads were shown to people who are in the same age group as most of your existing customers -- or if they fit the new market that you’re trying to sell to. You can also see if people are converting via mobile or desktop. If you’re targeting youth who spend most of their time on smartphones, then you should see if the people viewing your ads do so via mobile or desktop. If you don't do this you might waste money showing your your ads to the wrong crowd. 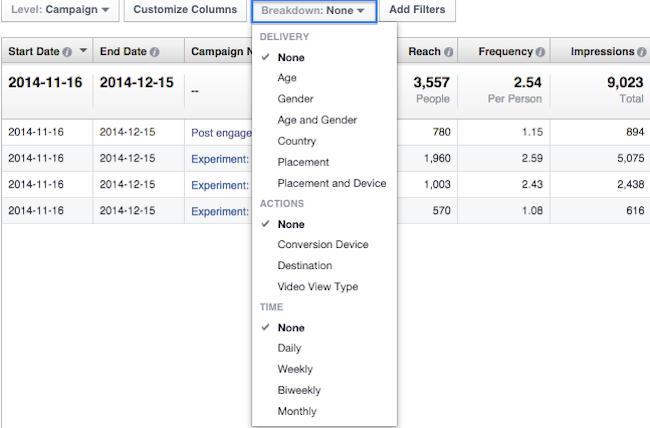 Before you start optimizing Facebook ads, check your ad reports to see if you’re targeting the right audience. Don't rush to turn off an entire ad set when it doesn't seem to be working. You might leave precious traffic & revenue on the table! And within each ad set, you’ll create multiple ad creatives to test & see what works with your target audiences. Assuming that you properly tailor the ads within each ad set to the right target audience -- 5 ad sets with 3 ads each, for example -- you will have created 15 ads. 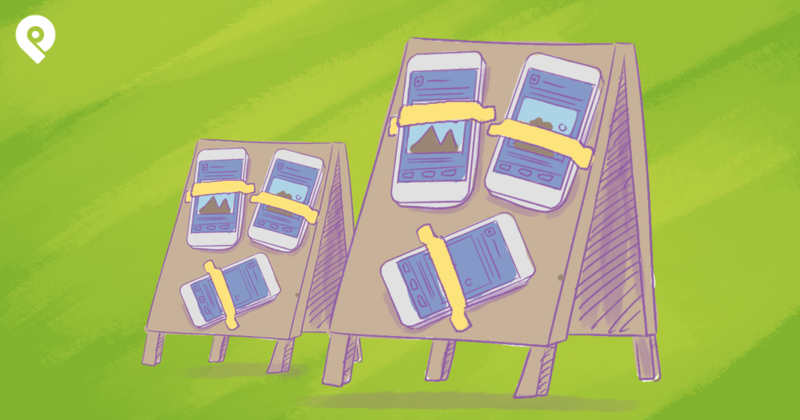 Turning off an entire ad set will kill 3 ads -- ads that might have worked in the past! Here's how to prevent that from happening. Click "Level: Account” on your ad report & choose “Ad”. Next, make use of the data breakdown options I told you about in tip #1. You can see which ads are working & NOT working with specific age groups, genders, countries, placement & more. If you see that conversion rates are low or too expensive with the 18-24 age group -- use Facebook's Power Editor to modify those ads to target people older than 24. Look at your ad breakdown data to find out what's NOT working. 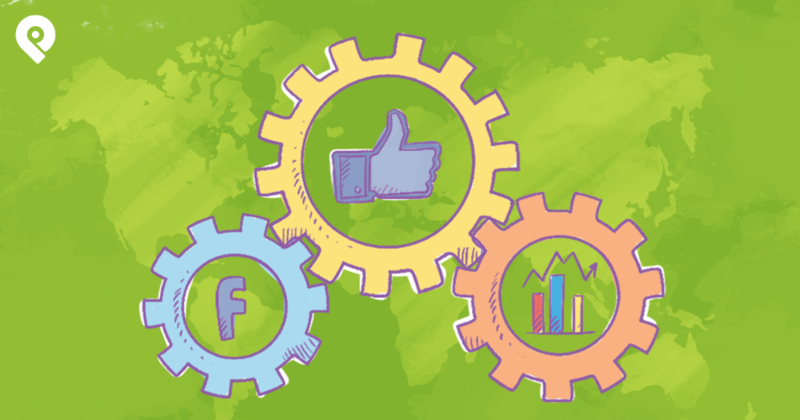 Know when you should start optimizing your Facebook ads? More specifically, which metrics you should examine before you optimize? I look at the most important metrics at the end of my conversion funnel. If you’re running ads for product sales, look at the total number of sales & cost per sale. If you’re running ads for post engagement, examine the costs per engagement from the past. If you’re running ads for Facebook email signups, look at the total number of registrations & cost per registration. Starting at the end of the conversion funnel -- instead of looking at click-through rates & reach -- will let you make changes to your ads that'll more significantly impact your end results & prevent you from abandoning effective ads. For the above example, if I had looked at click-through rates instead of the number of conversions & cost per conversion, I’d have thought that all 3 ads had similar performance. But when I look at conversions & cost per conversion, cost per conversion for the 2nd ad is nearly half that of the first & third. Modify your ads based on the most important metrics at the end of your conversion funnel. 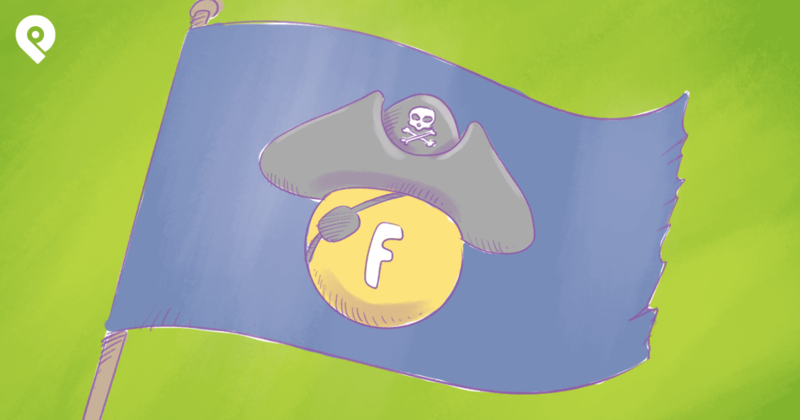 Many of you haven't ever looked at your Facebook ad reports. But BEWARE -- especially when the numbers of conversions & clicks are so close. When you click the ad for an expanded view, you'll probably see that the number of actual conversions was different than what you thought. Only one of the 12 conversions was an actual registration -- which was the only thing my client was interested in gaining from the ads. You can make use of the ad manager by tracking just one conversion pixel in your ad. When tracking more than one conversion pixel, however, you could be duped into thinking that your conversions are cheaper then they really are -- because Facebook lumps all conversions together in the ad manager. And if you're not careful -- you might encounter the same issue on a Facebook ad report. If you track more than one conversion pixel, you must break down the ad report by the specific types of conversions you’re tracking. This report shows me how many times people who saw or clicked my Facebook ad viewed my page -- and how many of them signed up using their emails. These results ($1.73) were a far cry from what you saw above ($0.60). When you run ads with multiple conversion pixels, look at each type of website conversion -- not the overall number of conversions! Page managers sometimes panic when ads run but no results are provided within the first 24 hours. Many businesses have daily ad budgets of $5 or $10 -- and they quickly turn off ads that don’t convert or convert too expensively. They forget that the data they have on hand is not perfect. Most stats they use to make ad decisions are incomplete & insignificant because the ads haven't reached a large enough audience. Don't worry... you don't need a statistics degree to follow what I'm saying here. It's quite simple. There are plenty of resources to help you calculate the minimum reach before you start optimizing your ads -- such as the sample size calculator. As a rule of thumb, I usually wait for my ads to reach about 1,500 people before I consider any changes. And if you target by age & gender, make sure each segment reaches at least 1,500 people before taking any results seriously. Otherwise, you might be leaving money on the table. Before you start optimizing a Facebook ad, make sure the ad has reached at least 1,500 people. Many ad managers hope to improve conversion rates when they optimize their ads, but they leave out one important aspect: cost per mille (CPM). CPM, which means cost per 1,000 impressions, gives you an idea of how much competition there is to reach the people you're targeting on Facebook. This will tell you how much your ads will cost. CPM directly affects your cost per conversion. You create 2 ad sets for your email signup campaign: A & B. For ad set A, a $100 CPM and 10% conversion rate means you'll generate 100 email signups at $1 each. For ad set B, a $1 CPM and 1% conversion rate means you'll generate 10 email signups at $0.10 each. Despite the different conversion rates, for both ad sets, the cost per conversion is the same -- which means the ad sets are equally effective. Don’t just focus on improving conversion rates when you manage Facebook ads. Consider the CPM for each target audience & decide whether you could improve cost per conversion & maximize your ad spend on an audience with lower CPM. There's no exact science that backs up the claims many Facebook experts make about how often you should show the same ad to the same user. Part of the problem is that reach doesn't mean a user saw your ad on Facebook. It just means that your ad appeared while they were using the website. 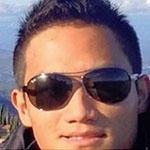 Psychology experts say that someone must see something at least 3 times before they'll remember it. So even if someone notices your ad each time it appears on Facebook, you should still show each ad at least 3 times. But there's also concern about burnout. Will people turn off your ad (or label the ad as spam) after seeing it one too many times? 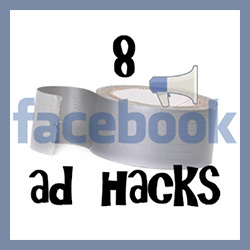 Try to estimate how often someone will notice your ad when it's shown to them on Facebook. Do this by rating the ad's visual attractiveness on a scale of 1-10 -- 10 being the most attractive. A rating of 1 could mean that only 10% of the people who are shown the ad actually notice the ad on Facebook. A 5 rating could mean that about half the people who are shown the add will notice it. The point of this exercise is for you to make an informed decision based on the appearance your ads. How likely is it that those ads will grab somebody's attention? Perhaps the best guidelines are found in success stories. Aim to show each ad a minimum of 3 and maximum of 10 times in the news feed. The minimum could jump to 10 and maximum to 40 for ads that are shown in the sidebar. If you're not familiar with ad frequencies & have no prior data from your ad campaigns, let your ad frequency go above 3 before you start making changes. The maximum limit should vary depending on whether you show it on the news feed or sidebar. Facebook's refined campaign structure helps page managers better administer their ad campaigns by making it easier to track what they've changed. When you change your target audience, modify your ads by customizing the images & copy for different tastes. Merely re-allocating your ad budget shouldn’t affect things like the cost per conversion of each ad. Don't change a thing when running ads at specific times. 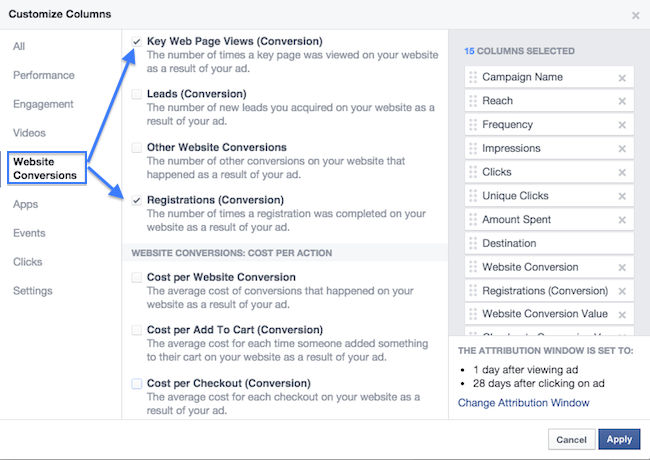 Let Facebook show the same ads to your target audience so you can see if the total number of conversions & cost per conversion improved with the refined ad schedule. 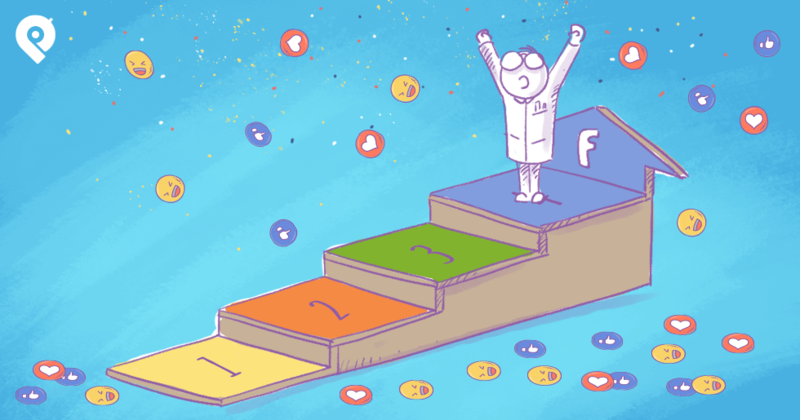 Get to know the Facebook campaign structure to understand how best to systematically optimize your ads. 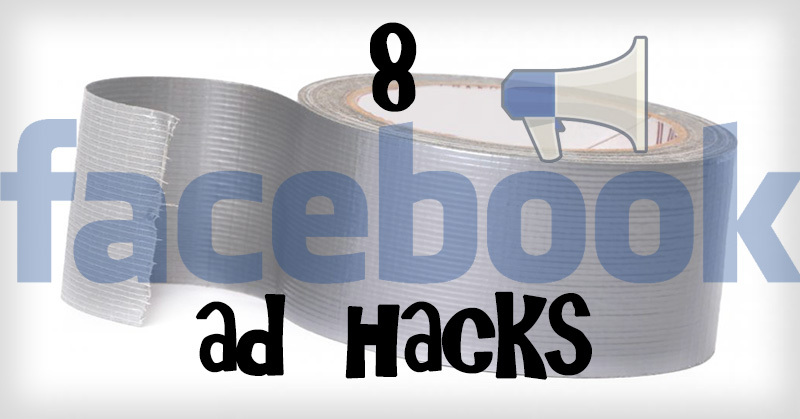 I hope at least a few of these tips will be useful the next time you manage your Facebook ads. 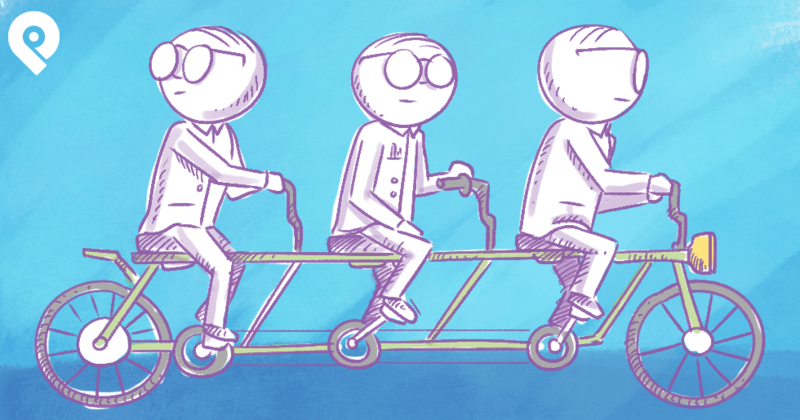 All of the issues above are common challenges I faced as an ad manager. I'd love to hear about different scenarios you've encountered while running Facebook ads & any advice you have for overcoming hurdles. Even if you haven’t found a solution, let's spitball together in the comments below!